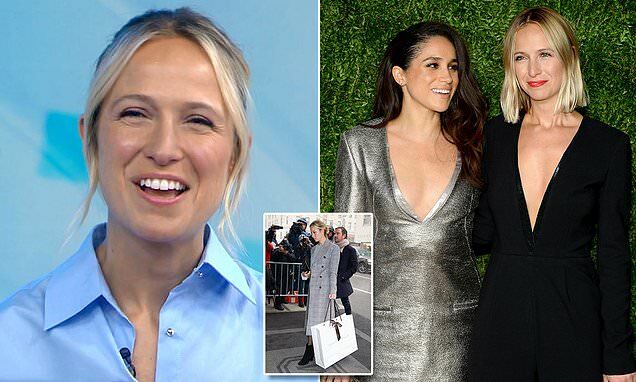 Meghan Markle's close friend Misha Nonoo has revealed the mother-to-be was glowing at her lavish shower in New York City, but she refused to confirm whether she was the one who introduced the former actress to Prince Harry. The British designer, who was one of the guests at the Duchess of Sussex's star-studded shower last week, appeared on the Today show Friday to reveal her three wardrobe essentials. However, after years of speculation, Today anchor Savannah Guthrie couldn't resist asking Misha, 33, if she was really the matchmaker who brought the Duke and Duchess of Sussex together. Although it has never been confirmed, Misha is thought to be the person who set up Meghan and Harry when they met first met in London in July 2016. Many previously speculated that it was Markus Anderson, a consultant for the elite members-only club Soho House, who brought them together. He was largely credited to be the matchmaker until the royal couple revealed the mutual friend that arranged their blind date was actually a she. 'We were introduced by a mutual friend,' Harry revealed in an interview with the BBC following their engagement. In January 2018, E! News reported that a source close to the couple confirmed it was fashion PR Violet von Westenholz who first set Harry and Meghan up on a blind date back in 2016.